So, this crazy process begins again. Alabama football players officially report a week from today although almost everyone is already on campus. Practice begins at 9:30 a.m. Thursday for the veterans and 7:30 p.m. for the rookies. None of this means much to anyone outside of the program since all practices are off-limits to outside eyes. There are three two-a-day practices sprinkled in with workouts scheduled for 9:30 a.m. and 7:30 p.m. on all three occasions. The only real date of significance is the annual “Fan Day” at Bryant-Denny Stadium. That spectacle is scheduled for 2:30 p.m. on Sunday, Aug. 8. Of course, this is the same event that led to this now infamous moment involving a baby and a Nick Saban autograph a year ago. Here are two quick videos I shot Saturday of the Crimson Tide’s first football practice since beating Florida two weeks earlier in the SEC Championship. 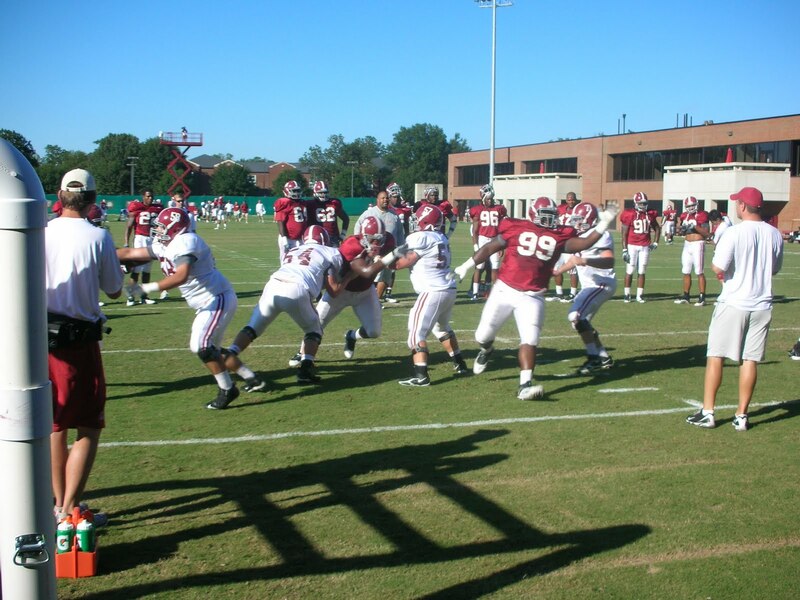 Another perfectly sunny afternoon in Tuscaloosa had the Crimson Tide practicing outdoors again today. As seen in the point-and-shoot photo masterpiece above, the defensive line was where I spent most of my media-viewing period today. Check out the photo gallery below for more pictures of the first and second teams working on the Kentucky game plan led mostly by coach Sal Sunseri — easily the most excitable coach that we can see in practice everyday. Over on the exercise bike was Jeramie Griffin, the sophomore running back who tore his ACL early in August preseason practice.